After a short introduction by Daniel Philpott, Associate Professor of Political Science and Peace Studies at the University of Notre Dame, His Grace Bishop Angaelos, General Bishop of the Coptic Orthodox Church in the United Kingdom, gave an address titled ‘Christians in the Middle East: Light in darkness, hope in despair’. The Conference, themed ‘Under Caesar’s Sword: Christians in Response to Persecution’ took place at the Pontifical Urban University in Rome, Italy, from 10-12 December 2015, organised jointly by the Centre for Civil and Human Rights at the University of Notre Dame and the Religious Freedom Project at the Berkley Centre for Religion, Peace, and World Affairs at Georgetown University. The conference was co-sponsored by the Community of Sant’Egidio. 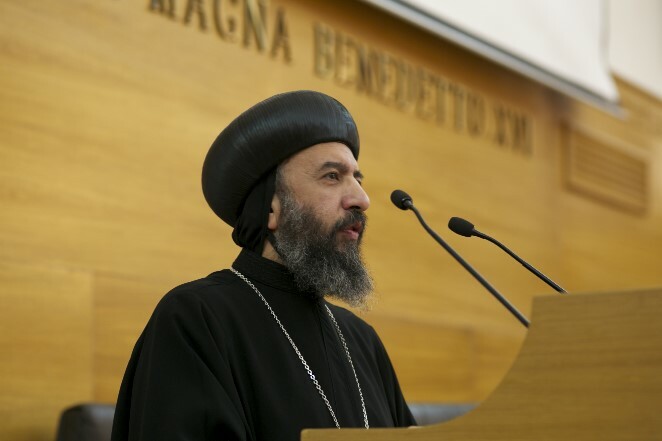 0 Comment(s) to the "HG Bishop Angaelos delivers keynote address at international conference in Rome on the Christian response to persecution "